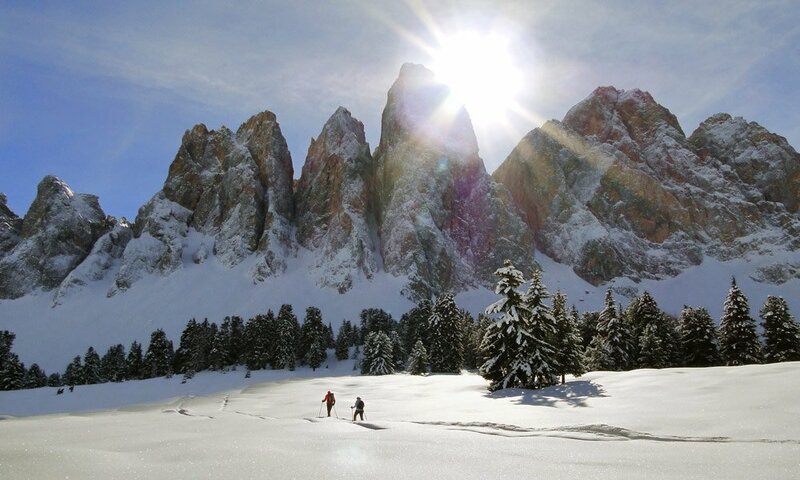 A special magic radiates across the Funes Valley when the alpine landscape wears its beautiful white winter dress. However, you may still take long walks even during the cold season. 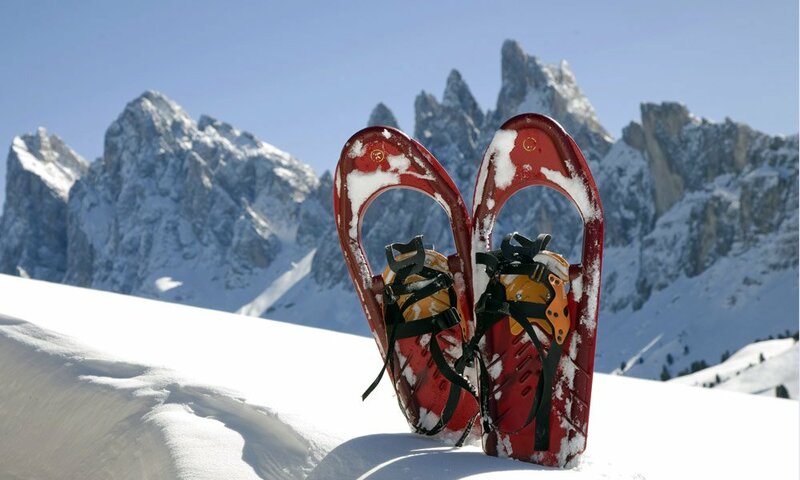 Snowshoeing or ski touring in Funes offers you a very special holiday experience. Tuesdays, a guided snowshoes hike leads you from the parking lot Eistil across the meadow Spoierböden to the alpine lodge Halsl. After a break, you return to the valley on the hiking trail no. 9. A snowshoe hike from the Zannes Alp to the Gampen Alp takes place on Wednesdays. After a break, you may return to the valley on a fun toboggan ride. 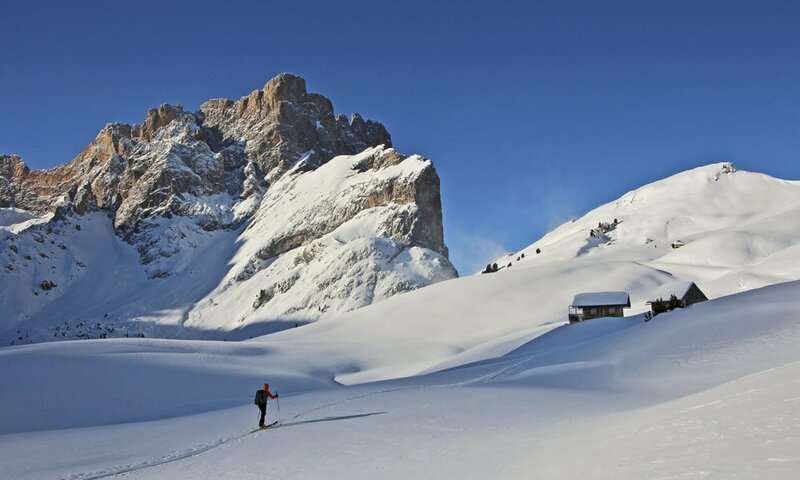 A more demanding tour for experienced hikers: a snowshoe tour along footpath Adolf Munkel. Take a break at the Geisler Alp and then return to the valley on a toboggan. You’ll also have the opportunity to participate in guided tours, which extend over several days. More information is available at the Tourist Office Funes. The starting point of the four-kilometer tour on the Zendleser Kofel is at the Zenser Alm. From here you are going to visit Kirchwiesel, the Kaserill Alm and the Brühler Schupfe, before reaching Zendleser Kofel after around 2 and 1/2 hours. A four-kilometer tour is also the one starting from Zanser Alm to Bronsoijoch (ridge). It will take around 2 and 1/2 hours before arriving at Bronsoijoch, passing by Kirchwiesel and Gampenalm. Going to the peak of Laite Va Piz you start at Ranui from Waldschenke parking area. Passing by Weissbrunn and Brogles Alm you will reach Laite Va Piz after around 3 and 1/2 hours on a six-kilometer-long path. To go to Gabler you start at Fermeda/Schlemmer parking area and reach your destination passing by Grulanegg. This tour takes around 2 and 1/2 hours and has a length of 4,2 kilometres.